The collaboration, among researchers from ICIQ's Palomares and Vidal groups, the Physical Chemistry of Surfaces and Interfaces group at the Institut de Ciència de Materials de Barcelona (ICMAB-CSIC) and IMDEA Nanocienca, sheds light on the reasons behind the differences observed in perovskite solar cell performance by comparing four different HTMs that present close chemical and physical properties. 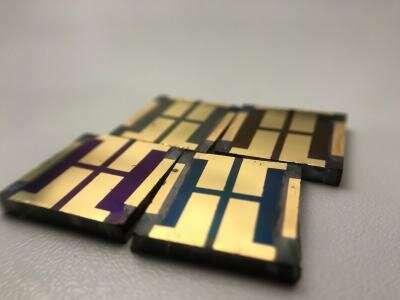 Perovskite-based solar cells are approaching the stability necessary to be trusted as potential commercial products under working conditions. The major concern is the materials used—particularly spiro-OMeTAD,the most widely used HTM, which is prone to degradation. Therefore, current research is focused on finding alternatives. "Scientists have been designing new molecules that could replace spiro-OMeTAD for years. Looking for molecules with similar electrical and optic characteristics than spiro-OMeTAD and hoping to get similar results. But when testing new HTMs, instead of getting similar results, the cells worked very badly. So we decided to understand why this happened," explains Núria F. Montcada, a postdoctoral researcher at the Palomares group and one of the first authors of the paper. The researchers realized that new molecules with the potential to replace spiro-OMeTAD as HTM were selected on the basis of their properties in solution. However, in functional solar cells, these molecules are prepared in the form of thin films whose surfaces, in turn, are placed in contact with other materials, forming interfaces. The created interfaces may confer changes in the properties of the molecules. "We have to be aware that the perovskite-HTM interface may shift the energy levels and produce undesired energy misalignments. We've come to demonstrate that the study of molecules needs to match the conditions under which the molecule is going to be used—otherwise molecule design is just trial and error," says Montcada.